The Grand Junction Daily Sentinel has printed a full copy of the community written draft bill to elevate the Colorado National Monument to the nation’s 60th National Park. The draft was entirely created by the local five member committee Senator Mark Udall and Congressman Scott Tipton appointed back in June. Committee members include: Glade Park Rancher Warren Gore, Michael Burke of the Grand Junction Chamber of Commerce, Ginny McBride of the Colorado National Monument Association, former Congressional staffer Kristi Pollard, and local business owner and cyclist Jamie Lummis. Reps. Udall and Tipton released the committee’s draft bill, the first week of April 2014. We urge all Coloradans to check the full draft provided in the link or review the bullet points below. We have a multitude of local leaders, business owners organizations and residents to thank for moving this effort forward to this critical point of draft legislation. Now, that we’re here your comments are vital to seeing the Monument through to official national park legislation within the current session. At the bottom of this page you’ll find direct links to web portals Congressman Tipton and Senator Udall set up specifically to hear feed back and support from locals. If they receive overwhelming support via these portals we believe the Colorado National Monument will take its rightful place among America’s 59 national parks. Please take just a moment to help make this happen by contacting a representative and telling them you support making John Otto’s life long dream of a national park finally come true in 2014. 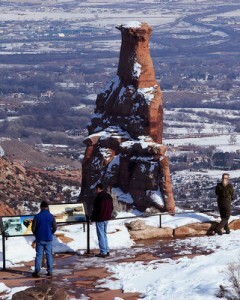 ■ The boundaries of Rim Rock Canyons National Park are the same as Colorado National Monument. ■ Existing rights of way are unaffected; Glade Park access is protected. No federal fund can be used unless they were appropriated before establishment of the park. ■ The air quality designation for the park will remain Class II under Section 162(b) of the Clean Air Act. It could only change at the request of Mesa County and the Colorado Department of Public Health and Environment. ■ Rim Rock Canyons National Park Advisory Committee established with 15 members representing local government, business and industry and Southern Ute Tribe. Printed with express permission of the Grand Junction Daily Sentinel and with thanks to Dean Humphry and Gary Harmon. CNM and the S curves on Rimrock Drive just above the tunnel on the east side. Rim Rock Canyons National Park would become the nation’s 60th park under legislation proposed by a five-member panel charged with drawing up a measure to upgrade the status of Colorado National Monument. The proposed legislation, summarized in several bullet points on a web page released by federal legislators, mirrors many of the concerns raised about park status during more than a year of study by another committee, including preserving the existing air quality classification of Colorado National Monument. It also would keep the current boundaries and prohibit the establishment of buffer zones around the 20,000-acre monument, which is bordered by Fruita, Grand Junction and Glade Park. Existing access for Glade Park residents on the east end of Rim Rock Drive would be preserved in the legislation, which also would allow the National Park Service to build a bypass at the east entrance for Glade Park residents and commercial vehicles. While the proposal addresses many of the concerns raised over decades of discussion about park status, a member of the five-member committee that drafted it said the proposal doesn’t represent the final word. “There is nothing in the proposal that we would consider non-negotiable,” said Ginny McBride, who heads the Colorado National Monument Association and is a member of the citizens committee. That includes the proposed name, McBride said, suggesting that the proposed new moniker was the result of some prolonged discussion. The committee was formed at the request of U.S. Rep. Scott Tipton, R-Colo., and U.S. Sen. Mark Udall, D-Colo., both of whom stressed that no bill has been introduced and that more work is expected. “The only thing that’s cast in stone are the canyons and spires” of what is now known as Colorado National Monument, Udall said. Tipton stressed as well that no legislation has been introduced and that none would be without community backing. The committee worked closely with Tipton and Udall staffers in western Colorado and in Washington, D.C., McBride said. One element of the draft legislation not called out in the summary says Rim Rock National Park couldn’t be used to prevent development in the Grand Valley or other areas. “The fact that an activity or use on land outside the park can be seen or heard within the park shall not preclude the use or activity outside the boundary of the park,” the draft legislation says. The advisory committee envisioned by the draft calls for 15 members to serve staggered three-year terms and represent Mesa County, Grand Junction, Fruita, Palisade, Glade Park, and the Redlands. The Grand Junction Area Chamber of Commerce, West Slope Colorado Oil and Gas Association and Southern Ute Tribe also would be represented. Six other members, who must reside in or near Mesa County, would represent tourism, outdoor recreation and the management and protection of the park’s resources. Warren Gore, a Glade Park rancher who sat on the committee and has dealt with attempts to enlarge Colorado National Monument for nearly 30 years, said the measure represents an opportunity to halt meddling in the park. By having Congress designate the monument a national park, “it keeps some president with no ties to Mesa County from doing what President Clinton did in southeast Utah,” Gore said, referring to Bill Clinton’s designation of the Grand Staircase-Escalante National Monument under the 1906 Antiquities Act. In addition to McBride and Gore, Kristi Pollard, Jamie Lummis and Michael Burke served on the drafting committee. Udall and Tipton set no timeline for the introduction of legislation, though Udall did note that he had mentioned a 90- to 120-day comment period when in Grand Junction last month. Turning the Colorado National Monument into the country’s newest national park has been years in the making. ■ 1906 — John Otto is captivated by the sight of canyons and monoliths hewn by eons of erosion of the uplift overlooking the Grand Valley. Otto is inspired to seek designation of the area as a national park. ■ 1911 — President William Howard Taft designates the area as a national monument, fulfilling a portion of Otto’s vision. ■ 1911-1987 — Discussion of park status continues, but no bill is drafted. ■ 1987 — The National Park Service asks U.S. Rep. Ben Nighthorse Campbell, D-Colo., to support expansion of the monument. The idea got no traction and even earned opposition from the Bureau of Land Management. ■ 1997 — Interior Secretary Bruce Babbitt restarts the discussion with a visit. 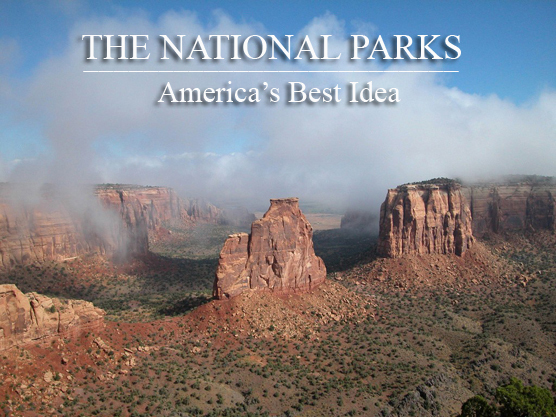 ■ 1999 — Babbitt proposes several new monuments and the expansion of Colorado National Monument. ■ 2 000 — Congress passes and President Bill Clinton signs legislation sponsored by U.S. Rep. Scot McInnis, R-Colo., establishing the Colorado Canyons National Conservation Area bordering — but not expanding — Colorado National Monument. ■ 2010 — U.S. Sen. Mark Udall, D-Colo., says he wanted to consider the status of Colorado National Monument. ■ 2011 — Udall, in a town hall at Colorado Mesa University, calls for park status and says the Grand Valley community could write the legislation designating the monument a park. ■ 2012-2013 — A committee of Grand Valley residents meets several times to discuss the merits of park status. The committee disbands without making a recommendation. ■ 2013 — Udall and U.S. Rep. Scott Tipton appoint a five-member committee to draft a bill that would redesignate the monument while addressing local concerns. ■ 2014 — The high points of legislation drafted by the committee are released by Tipton and Udall. Deanna Benzschawel of Sheboygan, Wis., admires the view Monday from Cold Shivers Point on Colorado National Monument. Benzschawel was touring the monument with her daughter Leah Cabot, who moved to Grand Junction from Pueblo two weeks ago. Through boom and bust the Colorado National Monument has been an economic staple of the Grand Valley, right alongside our historic orchards and our growing wine industry. It’s a place people clearly want to see and yet every single day visitors who fly into our local airport or travel I-70 (particularly people on National Park tours) bypass our monument and valley and miss the unique in the world experiences it offers. As a community we miss out on sales tax revenues that benefit, not tourism, but our public schools, public safety, the maintenance of our roads, bridges and infrastructure in addition to projects we love like the Avalon, Riverfront Project or Las Colonias and Matchett Parks. As tax payers we agree the city and county should spend money to promote the Grand Valley and University and draw businesses through CMU, the Grand Junction VCB and GJEP. Many are beginning to realize a national park would help do all three, free, thanks to the instant international and national exposure that follows national park status. The March 2014 edition of Sunset Magazine features a guide to America’s national parks, specifically featuring Rocky Mountain National Park. Numerous national articles have featured Pinnacles NP since Congress named it America’s 59th National Park in January of 2013. That kind of regular, large-scale publicity, along with an instant home on Rand McNally maps which only feature national parks is advertising you’d be hard pressed to put a figure on…and it’s free. Every day we delay elevating the Colorado National Monument to the status it qualifies for as a national park is a day of wasted opportunity. Congressman Scott Tipton can claim substantial credit for the undeniable success of Pinnacles NP as he was on the House committee that awarded it final approval just last year. GVR-Citizens for a National Park is so thrilled he is now able to introduce and carry similar legislation for his own voting district in this current legislative session and keep his election night promise to create jobs for Western Colorado. Thousands of local businesses and employees are now counting on that promise. Back in June of 2013 when Congressman Scott Tipton and Senator Mark Udall announced a local committee would create draft legislation to elevate the Colorado National Monument to a national park , Tipton rightly told CBS 4in Denver, “It would draw more international visitors, would help the hospitality sector, the service sector, it would help an area where unemployment is too high.” Mr. Tipton really knows what he’s talking about. Many people don’t realize that at a very young age Congressman Scott Tipton founded an impressive business in Cortez, selling American Indian pottery. According to the Wall Street Journal, Mesa Verde Indian Pottery and Mesa Verde Trading have become some of the best-known pottery firms in southwest Colorado’s Four Corners region . Mesa Verde National Park has supported Mr. Tipton’s family and thousands more like his for decades catering to the international and national tourists who flock to the World Heritage Site. We believe GVR-Citizens for a National Park’s many individual supporters including Tillie Bishop, Tim Foster, Josh Penry, Warren Gore, Shane King, Kristie Pollard, Bernie Buescher, Jamie Hamilton, Randall Cupp, Kat Rhein and businesses like Alpine Bank, Home Loan State Bank, Gateway Canyons Resort, Benges Shoe store, Colterris Winery, Grand River Vineyards, CAVE, Pollux, Bin 707, Dos Hombres, Springhill Suites by Marriott, Doubletree by Hilton, and Haggle of Vendors along with every local municipality, local chambers, tourism boards, bicyclists, hikers and thousands more residents as a vital community are more than ready to “pipe up” as Mr. Tipton suggested to offer the Monument maximum protection as a national park. We appreciate that the Congressman and Senator Udall continue to work so hard to move this process to a quick and successful conclusion. Our community eagerly awaits the announcement of draft legislation in the next two weeks. A recent Daily Sentinel editorial points out that the modest 10-percent increase in visitors it’s estimated national park status would bring the Monument over time may not be a panacea to the current fragile economic recovery in the Grand Valley… but there’s no question it would help. If Pinnacles National Park in California, Black Canyon of the Gunnison National Park or Great Sand Dunes National Park here in Colorado are any gauge, it’s clear, park status will finally recognize the Monument’s history and qualifications, offer a measurable economic benefit and best of all, greatest protection of the pristine nature and solitude we all cherish. The article below ,by Gary Harmon, ran in the Grand Junction Daily Sentinel Tuesday, March 4 , 2014. We reprint it here along with photo (above) by photographer Gretel Daugherty with the express permission of and thanks to the publisher. Colorado National Monument generated more than $26.5 million in economic activity in the Grand Valley in 2012, a National Park Service study released Monday said. 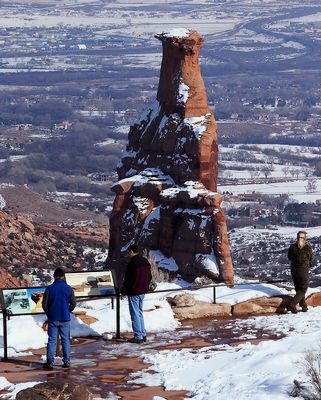 Another study released the same day said the 16-day government shutdown cost gateway communities near national parks, such as Fruita and Grand Junction, more than $414 million in visitor spending. The shutdown study didn’t single out the effects on Colorado National Monument of the closure of the parks, but it did peg overall attendance in 2013 at a little more than 409,000, about 45,000 less than the level of visitation the Park Service logged in 2012. The 2012 visitation figure reflected local efforts to promote the spires, canyons and red-rock walls of the 20,000-acre monument overlooking the Grand Valley, said Barbara Bowman, manager of the Grand Junction Visitor and Convention Bureau. The back of Bowman’s business card, in fact, shows an iconic photograph of the monument. The back of the business card that Bowman’s boss, Debbie Kovalik, carries shows the wine country of Palisade. Kovalik is the director of economic, convention, and visitor services for Grand Junction. Even though the VCB leans heavily on the description of the valley as “Colorado’s wine country,” “We always lead with the monument,” Bowman said. If the monument were to be designated a national park, it might be able to capture a significant international market, Bowman said, noting that 26 international tours a year arrive at Grand Junction Regional Airport and take buses directly to national parks in Utah without stopping to take in the monument that overlooks their route through the Grand Valley. The monument also supports 356 jobs in the Grand Valley, the Park Service report said. Nationwide, Park Service venues, including parks, monuments, battlefields, historic sites and other locations, generate $26.75 billion, the report said. It also highlighted direct spending of $14.7 billion by 283 million visitors in communities within 60 miles of park sites. Overall, the Park Service generates $10 for every $1 spent on the agency, according to the peer-reviewed report drafted by the U.S. Geological Survey. Interior Department officials noted that economists with the survey were given the task of gauging the economic effects of Park Service venues after the author of previous reports died. Direct comparisons between the 2012 and previous years’ surveys aren’t directly comparable because of the different methodologies, officials said. Below are links to the March 2014 issue of Sunset Magazine featuring a national park guide and several recent articles on the newly named Pinnacles National Park. Below is the latest Daily Sentinel article, by Gary Harmon and photographs by the talented Chris Tomlinson (reprinted with the Publisher’s express permission) regarding national park status. Our sources tell us the 5 member committee Congressman Scott Tipton and Senator Mark Udall appointed has signed off on final draft legislation and that draft is currently under review. Grand Valley Region Citizens for a National Park can not thank the committee and everyone who has signed the recent petition and shared it with family and friends enough. Nor is it possible to express the depth of our appreciation to the many local leaders, businesses and organizations who took the time to study this issue and weigh in with full support. We are closer to national park status than at any time in the past 107 years when John Otto submitted the first petition for a national park. We fully believe Congressman Scott Tipton and Senator Mark Udall will not fail the Grand Valley, but will announce official legislation to elevate the Colorado National Monument to a national park. This is about our history and future and about recognizing our park with the title it deserves. A visitor to Colorado National Monument stops at Independence Monument overlook to make a photograph Friday afternoon.The monument high country is 2,000 feet above the Grand Valley and is 32 square miles large.With the help of John Otto the monument was made a national monument in 1911.Otto was named the park’s caretaker, a job he held until 1927 with a salary of $1 a month. Elevating Colorado National Monument to a national park could reverse the economic slide of the Grand Valley, the chairman of the Junior College Baseball World Series said. Backers of the upgrade of Colorado National Monument to a national park need to pipe up, U.S. Rep. Scott Tipton said. He and Sen. Mark Udall, D-Colo., are waiting to hear back from a committee drafted to write a bill promoting Colorado National Monument to a national park. “Grand Junction, Fruita, Mesa County, we’ve got to see public support for it,” Tipton said Friday. Tipton’s and Udall’s staffs have had several talks about the monument, but they have yet to see the bill drafted by the committee. “We’ve heard they are making progress and we’re hoping to see the fruits of their work,” Udall spokesman Mike Saccone said. An online petition, meanwhile, has topped 500 signatures in favor of a national park and signatures are being collected at several locations in downtown Grand Junction, and elsewhere. Signatures of the online petition range from as far away as Ho Chi Minh City, Vietnam, in a recent addition to signers representing several states, from California to Illinois. The petition is at http://www.gopetition.com/petitions/make-the-colorado-national-monument-the-nation-s-60th-n.html. Udall made a promotion of the monument one of his first priorities in 2010, when he called for national park status for the monument in his first visit to Grand Junction as a newly elected senator. As chairman of the Senate subcommittee on national parks, Udall is in a position to press a bill forward. Udall and Tipton last year appointed a five-member committee to draft a measure that would give the 20,000-acre monument national park status and they had hoped to have legislation prepared by January. The arguments a handful of opponents, just over a year ago, used to try and stop the re-designation of Pinnacles National Monument to a national park, may sound hauntingly familiar. ” It will bring too many new rules and regulations! We don’t need “more” government! It will tighten air quality restrictions! It will impact neighboring properties! It will increase user fees! We will be “over-run” with tourists!”. Here at Grand Valley Region Citizens for a National Park we’ve learned first hand the historic road to creating America’s national parks has always been fraught with questions, fears and misinformation. While the majority of cities in America would give anything for the opportunity to tout a national park in their backyard the fact is only a rare few National Monuments are left in the United States which actually meet the National Park Service’s increasingly stringent list of qualifications. Pinnacles National Monument was one. The Colorado National Monument is another. Pinnacles National Monument officially gained park status at the beginning of last year thanks to the no less than heroic efforts of Rep. Sam Farr (D) California and a contingent of forward thinking leaders from the towns and counties surrounding the former national monument. At the time local leaders were faced with a desperately struggling economy. Leaders and residents alike gnashed their teeth and wrung their hands in meeting after meeting over falling sales tax and use revenues. Police, sheriff, and fire departments anguished over cuts to vital public safety programs while schools made the painful decision to cut teachers and increase class sizes. In the midst of all that hand wringing, all along, the answer stood no further than than a glance out any local office window toward Pinnacles National Monument. Pinnacles National Monument like the Colorado National Monument was created because one man in each place found the landscapes among the most spectacular they had ever seen and spent a lifetime working to protect it. John Otto is known as the “Father of the Colorado National Monument” for his successful efforts to get it protected as a monument and life’s work to make it a national park. For Pinnacles, it was Schuyler Hain, a homesteader, who arrived in the Pinnacles area from Michigan. During the next twenty years he became known as the “Father of Pinnacles” leading tours up through Bear Valley and into the caves. Hain spoke to groups and wrote articles urging preservation of the area and acted as unofficial caretaker for many years. His efforts proved fruitful with the establishment of Pinnacles as a 2500 acre national monument in 1908 by President Theodore Roosevelt. One year after its official re-designation as a national park nearby communites are reaping the benefits. Park status in one move recognized their history and the unique geologic and historic value of Pinnacles, gave the area instant national and international recognition and in so doing, boosted the local economy in a tangible way. 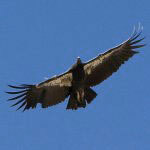 Here is the latest article from The Monterey County Herald. Backers of promoting Colorado National Monument to a national park are building a case that the Grand Valley wants a change in the status of the spires, cliffs and canyons. The just-minted Grand Valley Citizens for a National Park has collected resolutions of support from the Grand Junction and Fruita city councils and took steps to garnering support from Club 20, the Western Slope lobbying and promotional organization, on February 20th. The effort also got a show of conditional support and advice from a Glade Park rancher who has for decades fended off efforts to expand the monument. “I would support that bill” if it cemented the right of people to drive Monument Road to the Glade Park cutoff, protect Fruita’s access to a water line and include other protections”, Warren Gore said. He won’t lead the effort for a park, but he wants to participate in the drafting of legislation should it be introduced, Gore said. “I definitely want to have eyes” on any legislation proposed by U.S. Sen. Mark Udall, D-Colo., or U.S. Rep. Scott Tipton, R-Colo., whose 3rd Congressional District includes the monument, Gore said. Gore served as a co-chairman of a committee established by Tipton and Udall to discern the sense of Grand Valley residents on the issue. The committee, made up of supporters and opponents of a change in status, found a highly divided populace after 18 months of meetings and disbanded last year without making a recommendation. Grand Valley Citizens for a National Park has none of that ambivalence. “It’s a really, really big deal to land a national park,” said Terri Chappell, a spokeswoman for the organization, citing several of the economic advantages that backers hope to see with an upgrade in status. So far, 360 businesses have signed up to support the effort to achieve park status, Chappell said. Making the monument a national park “is critical to stabilizing the local economy,” she said. Chappell and Jamie Lummis urged the Club 20 tourism committee to back a resolution of support for the change. The unanimous vote on Friday puts the measure before the full Club 20 board next month. As with Gore, Grand Valley Citizens for a National Park wants to make sure any legislation contains provisions sought by skeptics worried about Federal overreach from a national park, as well as provisions intended to give local interests greater say in its operations. The draft resolution offered to Club 20 by Grand Valley Citizens for a National Park calls for preservation of the status quo when it comes to Glade Park access, Fruita’s water line and other issues. The National Park Service has rebuffed attempts by Grand Valley backers of professional bike races to conduct races over the 23 miles of Rim Rock Road, saying that such events are outside the mission of the monument. Our grassroots group is comprised of citizen’s, businesses, and organizations whose members passionately believe our national monument is worthy of ascending the ranks to become our nation’s 60th national park and that re-designation as a national park is critical to stabilizing and growing our regional economy as well as ensuring our community’s quality of life for generations to come.